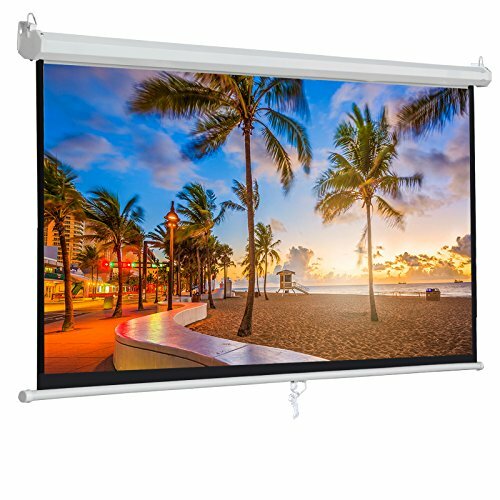 ★ ★ Height Adjustable-- The height of ZENY projection screen is easily adjustable and locks into place at any desired length (55 inch max length). ★ ★ Large 100'' Diagonal Screen-- 16/9 Aspect Ration (88 inch x 55 inch) with 120 degree viewing angle. MaxWhite 1.1 gain screen material. ★ ★ Easy to Set Up--This ZENY 16:9 projector screen is easy to mount and maintain, featuring a lightweight case and an anti-fabric, anti-static screen. ★ ★Crisp Viewing Angles -- This projection screen features a 1:1 high gain that provides brighter images, even in rooms lit with higher ambient lighting. Diagonal 100" offer 88" x 55" viewing area, 160 degrees with a matte white surface diffusing light in all directions.